Tecno Spark 3 is another great smartphone recently released by Tecno mobile with the following features, 6.2-inch HD+ display, 2GB RAM + 16/32GB ROM, Android 9 Pie OS, 4G LTE network and 3500 mAh battery capacity. However, your favorite features such as face ID Unlock, fingerprint sensor, and Dual sim is also supported. In case you don't know, this phone comes two different versions with little to no differences in terms of features or size. However, the only difference is the memory size, Normal version comes with 2GB RAM + 16GB ROM while the Pro version has 2GB RAM + 32GB ROM. Again it looks like the normal version doesn't support 4 LTE network while Spark 3 Pro support 4G network. 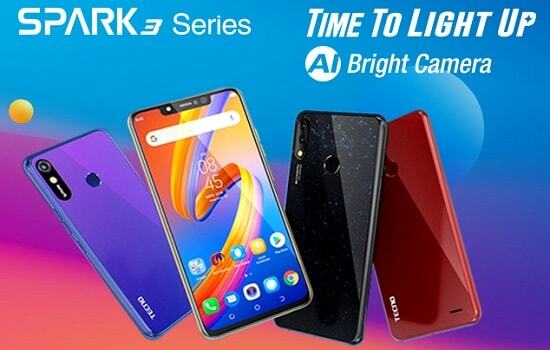 I don't see much difference between them apart from those once I mentioned above, let me quickly explain a few things you need to know about Tecno Spark 3 features. Tecno Spark 3 and Pro version is expected to stay within the price range of N45,000 - N65,000 respectively. The big 6.2’Super FULLVIEW display is one of the attractive sides of this phone but the overall design is superb and yes don't forget the optimized AI bright 13MP+2MP dual rear camera + 8MP front camera with ring Flash. In other words, the Spark 3 smartphone has all it takes to add to your beauty while giving you the privilege to capture some interesting moment and events in a grand style. Some of my fans have been asking me if they can upgrade their phone to the latest Android 9 Pie operating system which the answer is mostly big NO. They want you to upgrade to their latest smartphone to be about to enjoy the latest Android OS. Thanks to Tecno and their new Spark 3 that comes with the latest Android OS and as offer other amazing features you can't wait to check out. This smartphone is expected to be smart and faster in terms of performance following the 2.0 GHz Quad-Core processor it came with. The HiOS based on Android 9 Pie OS and 2.0 GHz Quad-Core processor will surely give you the best performance and stability you desire in a smartphone. I don't know if you are looking for a smartphone that has 3-6GB RAM and 64GB RAM which is good but trust me 2GB RAM and 16GB OR 32GB ROM is not bad considering the price. Besides, you still have the option to expand the storage memory with a microSD card. With 3500 mAh battery capacity, you will surely spark your world the way you want and when you want. However, most people desire to go for a smartphone with up to 4000 or 5000 mAh but the volume is not always the point but the quality and power management system. To find more about this smartphone, kindly go through the specifications below.